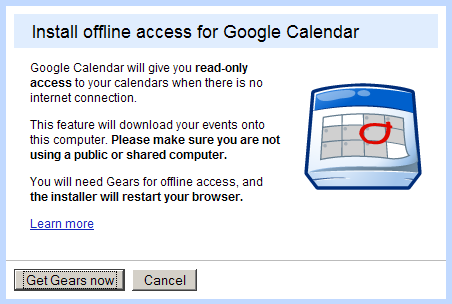 Apparently, Google Calendar has an offline mode just like Gmail. Although I didn’t like the way Gmail handles your offline data, since it dumps every mail and attachments’ to your hard disk in an un-encrypted fashion, I like the idea of always accessible Google Calendar. As always, you’ll need Google Gears to be installed in the first place.